It has been 3 years since the release of Infamous 2 which was accompanied by a wealth of mixed reviews and was considered a weak second instalment to the series, paling in comparison to the unanimously revered first instalment. The first two focused on the protagonist, Cole, learning to control his powers as a “Conduit”; a group of humans who gained the ability to control various different elements in an explosion at the beginning of the original game. Infamous: Second Son is the third instalment of the franchise and the first to be released solely on the Playstation 4 system. Everything from the sprawling skyline of open-world Seattle, to the neon lights reflected in puddles looks distinctive and real. 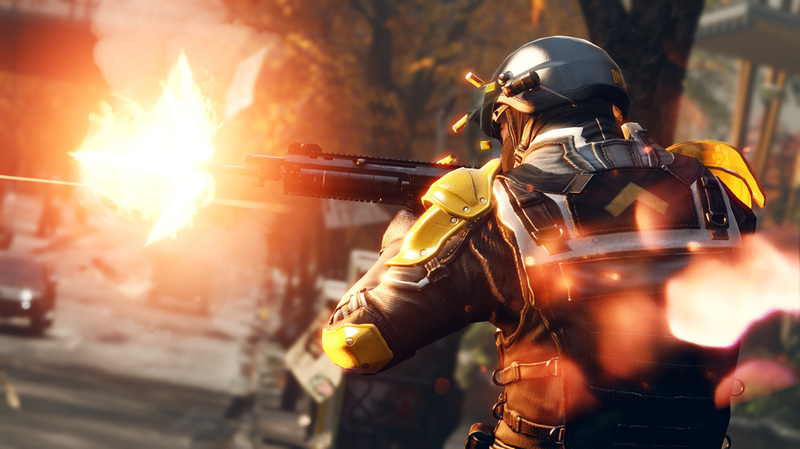 There are a multitude of side missions to work through, increasing the games longevity and your value for money, by encouraging you to reduce military control in each section of a city which truly feels alive; there are hundreds of people going about their business before running away screaming when they are caught in the middle of a fire fight, with very few looking alike. The tagging mini-games are especially innovative, fully utilising the PS4 controller’s capabilities. This is also true of some of the subtleties in the game like opening doors, pulling plugs and draining energy which all require a specific motion on the touchpad and make helps to even out the button mashing which would occur otherwise. Character models are similarly well designed with less of the comic book style, which the others in the series had adopted, being replaced by a much more realistic style of design. New protagonist Delsin Rowe appears arrogantly roguish with torn clothes and crimson beanie, while the villainous Augustine’s cold military appearance making her instantly dislikeable and somewhat similar to a red-headed Sigourney Weaver lookalike. Where the design of the characters makes them visually interesting, the voice acting makes them come to life and even emotionally engage with the audience. Troy Baker (Batman Arkham Series, The Last of Us) shows off the epic diversity in his voice acting by lending his vocal chords and motion capture form to Delsin himself and adding to the characters humour and likeability. Unfortunately, the rest of the small cast seem weak and one dimensional with a few seeming like mere cameos for the two or three mission arc which pertains to their character. The story similarly suffers from highs and lows. The opening scene does a good job at filling in the seven year gap between the second and third instalment, despite one glaring plot hole which unfortunately goes unexplained. However, the rest of the game play is based on fairly weak motivation. The morality system, which has recently become a video game staple, feels shoehorned into a series which helped define it at its birth. Second Son uses a simplistic “press one button to be good, press this button to be bad” system which often ends in an almost identical cut scene. This on its own would not be so bad if the choices felt realistic to Delsin’s personality, his mission to save the native American community in which he grew up doesn’t give any reason for him to be okay with killing innocent civilians or that his police officer brother would accept his actions if he did. In this sense, the player is denied any emotional turmoil because the only realistic reason for choosing evil actions is just to see both of the games endings. However, Second Son does give the player an unrivalled sense of freedom. 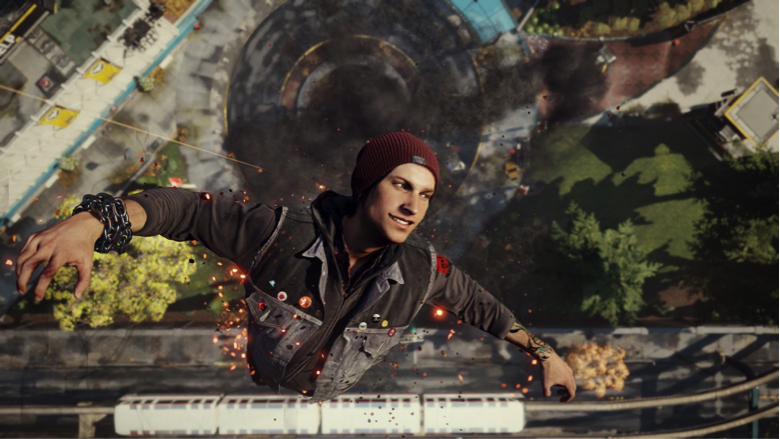 Delsin’s free running and smoke power add a huge sense of verticality to an already large map. The four usable powers range from interesting to absurd (what sort of a power is “Video” anyway?). The act of collecting Blast Shards to attain new flashy fighting moves and crazy acrobatic moves is still maintained but seems dumbed down to an extent; having each tracker drone marked on the mini-map renders the task just that, a task, as opposed to an actual rewarding quest. Often they begin to stockpile and as soon as Delsin rallies up a new power in his arsenal you have more than enough shards to instantly make him as proficient he would be if he had been wielding the powers for years. But the shortcomings in the power system are few and far between with Smoke, Neon, Video and Concrete each offering a range of unique movement and fighting styles which give the player a new found sense of empowerment. After all, that sense of power is what playing, as a superhero is all about. 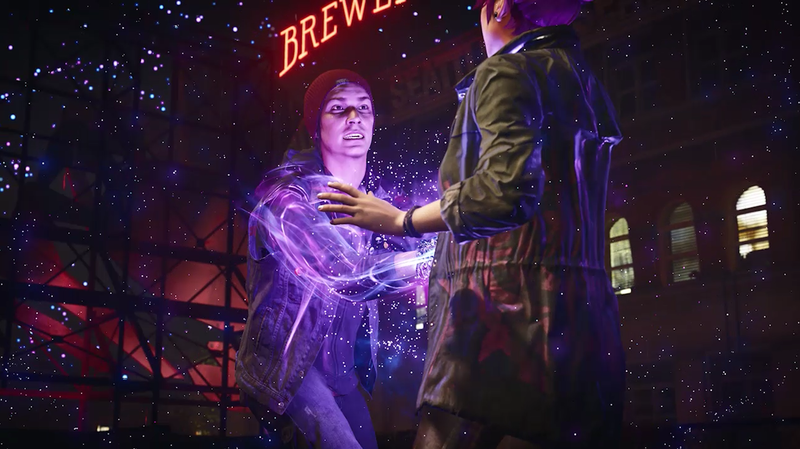 The cinematic karma streak sequences give Delsin’s finishing moves a bit of oomph, making the player feel utterly unstoppable. Overall, Infamous: Second Son is an enjoyable experience which has brought the franchise back to its original heights, creating a Seattle which is surprisingly enjoyable to explore; it even features real life landmarks e.g. the Space Needle. The power system is diverse and the story is mostly enjoyable, emphasising the modern debate over sacrificing public liberties for the safety of the regime. The biggest let down is the morality system, which seemed so original in the first inFamous game but is now old news in the industry.